Does your role require you to deliver engaging presentations, sales pitches and keynote speeches with confidence and charisma? Are you a company spokesperson who requires media training for TV and radio? Are you looking to increase visibility of your brand and need professional presenting skills to do so effectively? Are you a Vlogger or Influencer who wants to present dynamic videos for Youtube, IGTV and Facebook Live without getting lost in “the crowd”? If you answered YES to any of the above, this unique three day training course is for you! ‘Sensational Selling’ is a three day intensive presentation skills course where you will progress from novice to a professional level of on-screen presenting skill. We understand the pressures of having to deliver pitch perfect presentations on and off screen. Our team of Industry Experts have years of experience promoting and endorsing corporate businesses, products and services before audiences and to camera. We will personally coach you on time tested methods that top sellers like ourselves use to gain continued results. We’ll also coach you in how to potentially explode your sales revenue by developing an authentic on-screen presence which speaks to the needs of your audience. How to learn scripts and presentations quickly and easily – without notes! We keep our training groups limited so that each module is covered through personal one-on-one instruction from our team of Industry Experts that will review and coach you every step of the way. The atmosphere is informal and fun, yet the coaching intensive. You will also get the opportunity to train within a real TV studio and on the final day we will conclude our hard work with a screening and feedback session, as well as a certificate ceremony and “wrap party”! Improve your presenting skills and maximise your ability to present yourself to camera. Understanding how to fully utilise the power of presentation is priceless, and this course will be the beginning of bigger things for you and your brand! Here’s what our happy clients have to say about this course! Just like them you can put years of award-winning mainstream broadcasting experience in your corner. 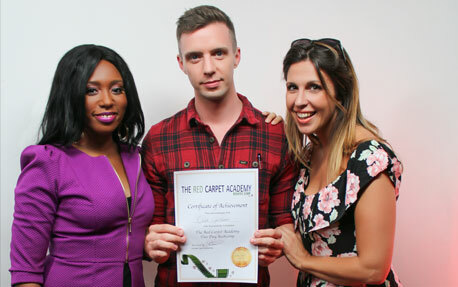 From entrepreneurs to public speakers to social media influencers, The Red Carpet Academy provides high quality and unique media training and camera presence skills that will lead you to success.